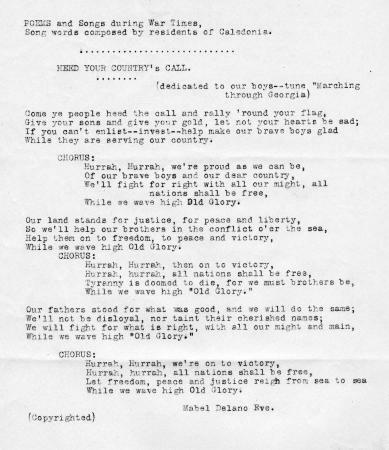 Lyrics to the patriotic song, "Heed Your Country's Call," written and composed by the residents of Caledonia, NY, which they dedicated to their "boys." Source: New York State Archives. New York (State). Education Dept. Division of Archives and History. World War I veterans' service data and photographs, 1917-1938. Series A0412-78, Box 11, Folder 12.